Springtime in the Mediterranean (March through May) brings warm weather and new crops such as brightly colored, pencil-thin asparagus; dark leafy greens; and artichokes. Nothing is quite like seeing these welcoming veggies lined up in the produce aisle or at the farmers’ market after a long, cold winter. Here are some simple Mediterranean-inspired veggie dishes to go along perfectly with a spring meal. Preheat the oven to 450 degrees F. Line a baking sheet with parchment paper and spread the grapes out evenly. In a small bowl, whisk the olive oil, honey, and vinegar and drizzle over the grapes to coat. Place the grapes in the oven and drop the heat to 400 degrees. Roast the grapes for 15 minutes. To serve, top the grapes with the walnuts and feta. PER SERVING: Calories 234 (From Fat 119); Fat 14g (Saturated 3g); Cholesterol 8mg; Sodium 91mg; Carbohydrate 28g (Dietary Fiber 2g); Protein 3g. Using a sharp knife, cut off the tip of the artichoke stems and remove the artichokes’ tough outer leaves. Cut a 1/2-inch piece off the top of each artichoke and trim any remaining thorns on the tips. Cut the artichokes in half. Place all the halves in a large bowl of water. To prevent browning, slice the lemon in half, squeeze the juice into the water, and place the lemon halves in the water as well. Using a spoon or paring knife, cut out the purple choke (not to be confused with the heart) in the center of the artichoke. Slice each artichoke half into 4 to 6 wedges and return them to the lemon water. In a Dutch oven, heat the olive oil over medium heat. Cut the leek into 1/4-inch slices, separate the rings, and rinse well to remove any sand. Add the leeks and garlic to the heated olive oil and sauté for 6 minutes. Drain the artichokes and pat dry. Add the mint and artichokes to the pan and continue to cook over low heat for 2 to 3 minutes. Pour in the stock. Bring the pot to a boil, reduce the heat to a simmer, and cover for 10 minutes. Stir in the white wine and simmer uncovered for 5 to 10 minutes or until tender. Season with salt and serve. PER SERVING: Calories 152 (From Fat 85); Fat 9g (Saturated 1g); Cholesterol 1mg; Sodium 113mg; Carbohydrate 12g (Dietary Fiber 5g); Protein 4g. You can save time by using frozen artichoke hearts rather than cutting them fresh. Just thaw them out and skip to Step 3. Leeks are grown in sandy soil, so rinsing fresh leeks well and separating the rings to remove all sandy debris is important. Heat a grill over medium-high heat. Cut the fennel bulbs in half, drizzle them with 1 tablespoon of the olive oil, and season with the salt and red pepper flakes. Grill the fennel for 4 to 6 minutes on each side. Using a sharp knife, cut the skin away from the orange, removing the white outer portion. Cut the orange in half; break it into segments. Toast the almonds in a skillet over medium heat for 3 to 4 minutes, stirring or tossing constantly to avoid burning. Sprinkle the almonds over the orange slices. Thinly slice the fennel and toss it with the orange slices and almonds. Drizzle with the remaining olive oil and serve. PER SERVING: Calories 169 (From Fat 103); Fat 11g (Saturated 1g); Cholesterol 0mg; Sodium 235mg; Carbohydrate 16g (Dietary Fiber 6g); Protein 4g. 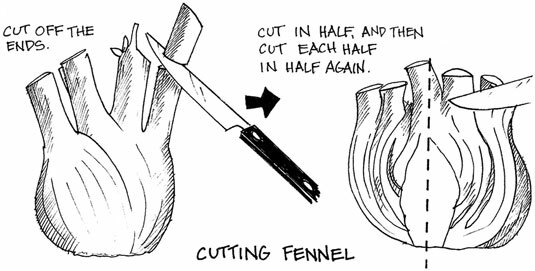 You can see how to cut fennel for this recipe here.